Mackerel tuna larvae (Euthynnus affinis) were raised from wild-spawned eggs at 77-79F on wild copepods, chub larvae and baby guppies. First record of Mackerel tuna culture. The Scombrids (tunas, bonitos and mackerels) are epipelagic, medium to very large, fast-moving/highly streamlined, predatory fishes found worldwide in tropical and temperate waters. The family (52 species in 15 genera) includes some of the world’s most important food fishes, some of which are threatened due to overfishing. Tunas have an interesting physiology – they are partially endothermic (warm-blooded). This enables them to maintain high swimming speeds at cooler water temperatures. Five scombrid species inhabit the ocean around the Hawaiian Islands. Laboratory reared juvenile Kawakawa or Little Tunny (Euthynnus affinis) released in the ocean. Mackerel Tuna or Kawakawa (Euthynnus affinis) is a schooling, coastal tuna species. It is locally common at 60 cm but can grow up to 100 cm. It feeds on small fish and silversides, as well as on squids, crustaceans and zooplankton. Predators include billfish and sharks. The flesh of mackerel tunas is dark and deteriorates quickly which makes this species less marketable than other tunas. E affinis was reared to the juvenile stage from wild collected eggs on two occasions, in February and April 2014. The larvae develop rapidly and require various food types to grow and survive. The eggs are pelagic, spherical, contain a single oil globule and measure about 0.9 mm in diameter. By 2 dph (3.6 mm TL), the larvae begin to feed on larger copepod nauplii. Near 6 dph (6.5 mm TL), the larvae undergo flexion and start to prey on other fish larvae, including their siblings. Young chub larvae were stocked in the tank at this stage. Supplying an abundance of this prey item noticeable reduced cannibalism and maintained the phenomenal growth rate of the larvae. Kawakawa or Little Tunny (Euthynnus affinis) larvae reared in the laboratory. E affinis larvae complete flexion by 10 dph (10-12 mm TL). At this size, they continue to only accept live fish but require larger foods than chub larvae. Luckily, an easily obtainable prey item was discovered – baby guppies. By 20 dph (25-30 mm TL), the larvae were consuming 6-8 guppies per day and doubled in size over the next 10 days. At 30 dph (50-60 mm TL), they were pelagic juveniles and finally accepted shredded fish and shrimp. Within 5 days they could be hand-fed. The fish were reared to between 80-100 mm and released. 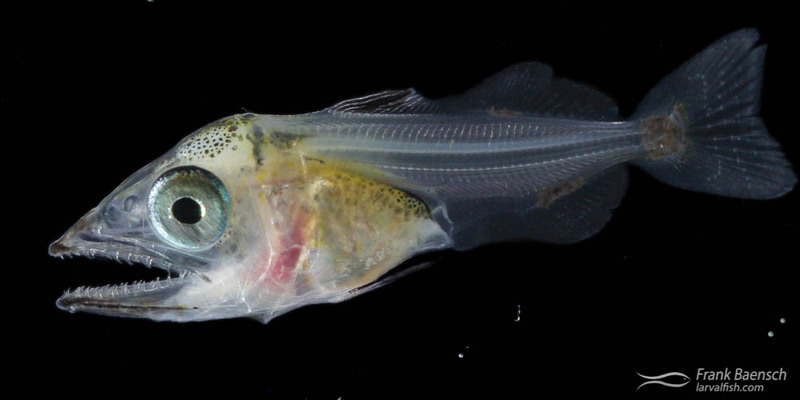 The large, elongated, toothy jaws are the most obvious specialization for pelagic life of tuna larvae. Cannibalism and prey specialization seem to be the biggest hurdles rearing this species. Feeding an abundance of young fish larvae; such as chubs, followed by freshwater livebearers; such as baby guppies and mollies, are possible solutions to these problems.